The restrictions of the Second World War constrained most American Scout camps; however, Workcoeman’s distinctions allowed it to prosper. The location near the center of the Northern Litchfield County Council’s territory overcame gasoline rationing. This, along with a series of well-orchestrated membership drives, combined to bring camp attendance to record levels. Over three years, the Council Executive Board raised ten thousand dollars to improve the facilities at camp. These factors prepared Workcoeman for heightened activity of the post war years. In 1946, a group of music teachers from Winsted, East Hartford, and Manchester brought Laurel Music Camp to Workcoeman. The previous summer, Elizabeth Sonier of the Gilbert School in Winsted organized a choir program on Highland lake. For 1946, she and Wallace Wagner recruited music teachers from around the state, who in turn brought their students to West Hill Pond. A total of forty-eight students attended, and performed under guest conductor Marlowe Smith of Rochester. This one-week of music camp was not the only group to use Workcoeman; since the 1930s, the local Girl Scout Council operated a week-long day camp after the Boy Scout season ended. However, when Bernie Moore was hired as the new Girl Scout professional, she developed a full camping program at Workcoeman. Down the Naugatuck Valley, the Housatonic Council shut down its summer program at Camp Irvine and struck a deal to send their boys to Workcoeman. These varied programs made the late 1940s some of the most active summers at Workcoeman. With the five weeks of Boy Scout resident camp, two weeks of Girl Scout camp, Laurel Music Camp, and a week of training, some of the staff spent nine weeks at Workcoeman. 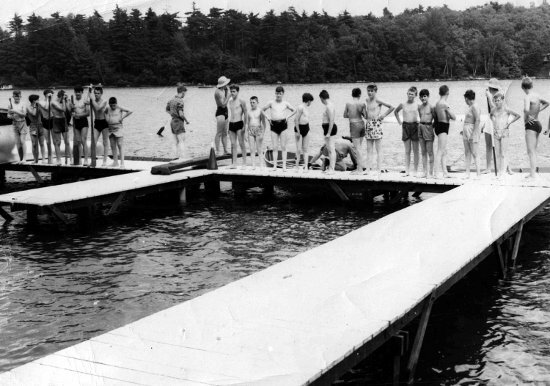 The image below shows Scouts at the waterfront during the late 1940s.